Tour dates: 15 June - 23 June 2009. Total distance: 750km. Download the Google KMZ track here. I use GPSBabel to upload KMZ tracks to my Garmin etrex GPS receiver. GPSBabel is available for Linux, MacOS X, and Windows. 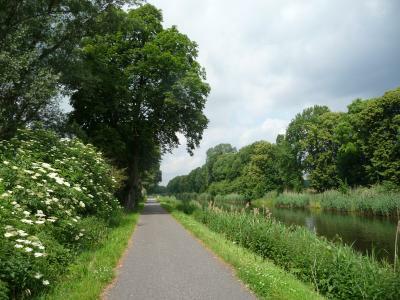 The Berlin-Kopenhagen cycle route is an official bike path built by Danish and German tourism agencies. The official route is available on their web site, which also offers useful maps. We had copies of the maps, but found that in Germany you are much better off with a GPS receiver (Garmin etrex HCx in my case) because the track is quite convoluted and very poorly signed, so you'd have to stop and check the map all the time. 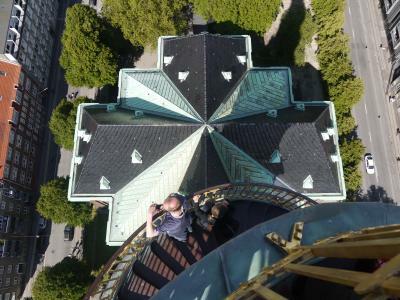 In Denmark you don't need a map, the route is perfectly paved and signed. 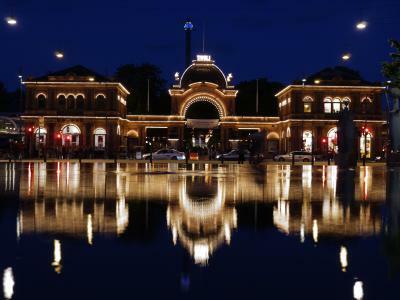 The official site suggests 15 day trips for the Berlin-Kopenhagen distance. We did it in five days at a fairly relaxed pace, riding around 100 km a day. The winds usually blow from the west or north-west, so we rarely had a full headwind. I didn't have much training that year because I had just returned from a two-month backpacking tour in Asia instead of riding my bicycle in the spring, but I got back in shape quickly. Our ride began with cheating: although we both live in Berlin Mitte where the route begins, we weren't too keen on riding city streets during the rush hour, so we used the S-Bahn (light rail system) to Birkenwerder at the edge of the city. 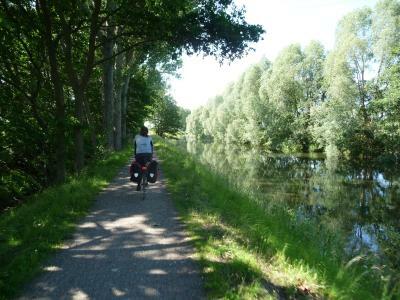 Most of the route in Germany leads through forests and alongside lakes when possible. 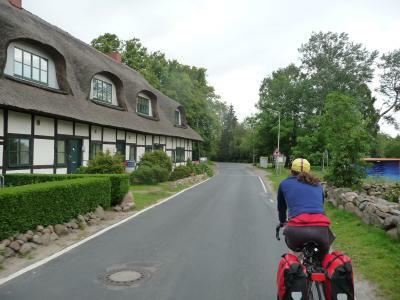 Just north of Berlin, the route follows the edge of the lake at Lehnitz, and then follows scenic rivers to Dannenwalde. On the second half of this stretch, the route is right at the edge of the river. The route then continues through forests to Fürstenberg, where we spent the night. 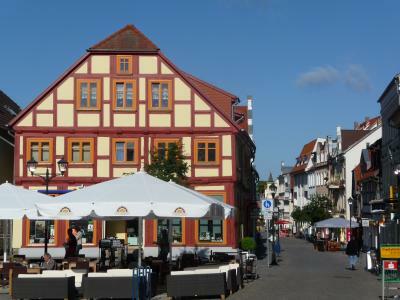 Fürstenberg, like most towns, have a tourist information center that can help with finding hotels. Many close early though, like 17:00. Parts of the path are well-paved, but others are dirt paths through the forest that require a lot of attention to avoid stones, roots, and patches of sand because I was riding 23mm tires. The route frequently passes through small villages, whose main streets are often cobblestones. Restaurants usually offer traditional cuisine, heavy on potatoes and meat and heavy sauces, not ideal. And many were closed on Mondays. The next morning we continued on the cycling route. Although that part of Germany is rather flat, there were several rather steep hills to climb, exceeding 10% in places on poor dirt surfaces. 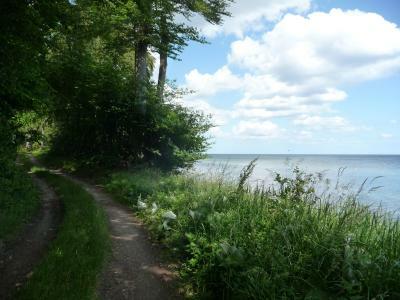 The route leads past several lakes - the states of Brandenburg and Mecklenburg-Vorpommern are a patchwork of little lakes - they can only be seen through the trees in a few places. Closer to the town of Waren, the forests are replaced by fields and meadows. 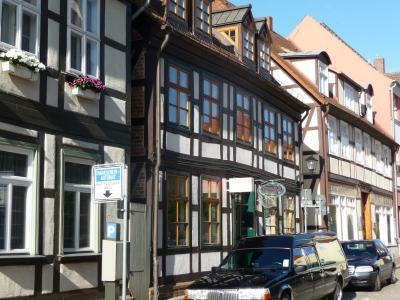 Waren is a quite pleasant old town, part pedestrianized and filled with well-restored and often half-timbered houses. It's a perfect place for staying overnight. 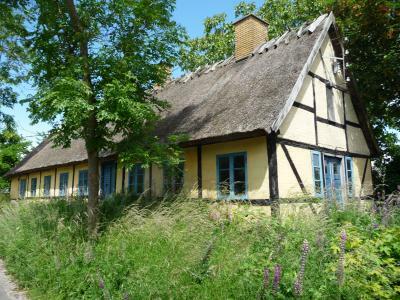 If you have seen the depressing, gray, and crumbling villages right after communist East Germany collapsed, it's amazing to see how so many villages and towns in this rather empty and underdeveloped part of the country have transformed to beautiful and well-maintained places. You can still see traces of the old times, but Waren and many others are practically indistinguishable from towns in the West, and may very well be better cared for. 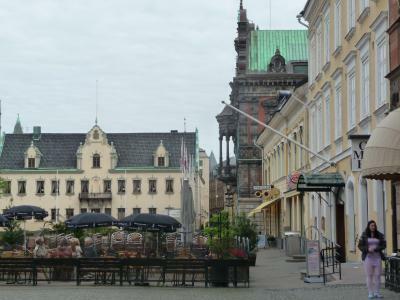 Our third day in Germany brought us close to Rostock on the Baltic coast. 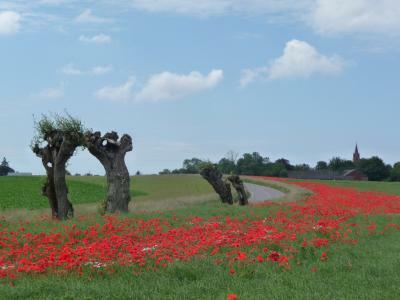 Once again, the route led us through forests, fields, and small pleasant villages. And once again the roads were occasionally rough, and in some places (more than on the previous two days) shared with cars. Signs were very difficult to find, we completely relied on the GPS track and occasionally confirmed the route on the maps we brought. We decided not to stay in Rostock overnight; we have been there before and preferred small country hotels over city hotels. So we decided to stay in Schwaan. Trouble was, all hotels and bed-and-breakfasts we called were full. Very odd, outside the holiday season on a Wednesday. In the end we did find a guestroom in a boarding school, which the listing called a hostel. It's a cheerless place with long dark corridors and people working in laundry rooms and kitchens, but the room itself was very nice and cheap and everybody was very friendly and helpful. On the way to Schwaan, we stopped at Krakow am See for lunch at a nice terrace overlooking the lake. We deviated from the cycle route, which loops around the lake through Serrahn. The next morning we rode the remaining distance to the harbor of Rostock, where we caught a ferry to Gedser in Denmark at 11:00. As expected, riding in Rostock involves wide roads with lots of traffic. The Scandline ferries between Scandinavia and Germany are huge and carry lots of trucks and cars; some contain as much as 700 meters of train tracks. They also have restaurants and a supermarket on board. The supermarket is mainly selling alcoholic beverages and is very busy on the way north because of very steep tax differences. After two hours, the ferry arrived in Gedser in Denmark. Due to a number of stupid static limits in Garmin's etrex GPS receiver, probably dating back to the dark ages in the previous century when a megabyte was a lot of space, my Danish GPS track was truncated. But in Denmark it's not needed anyway. The cycle route is not only perfectly paved - in about 250 km we had a few hundred meters of dirt paths - it's also perfectly signed. If a tricky intersection takes four signs in fifty meters to guide cyclists safely, then they'll put up four signs. You can't lose the way. 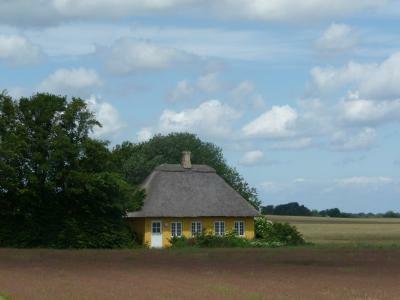 The scenery is exceedingly Danish: wide open fields, lots of views of the Baltic Sea, little thatched houses painted in bright colors, excellent roads, and little traffic. Much of the route runs along the Baltic shore. We spent the first night in Denmark in the little quiet town of Stubbekøbing. 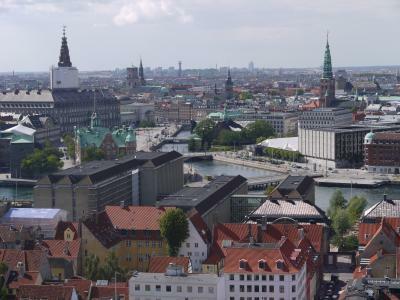 Like so many other Danish towns, its skyline is dominated by a massive cement factory. The next morning, we took the ferry from Stubbekøbing to Bogø, and followed the shore west across a dam. Then the route turns inland, going through numerous turns, all perfectly signed. Except one, and we chose the wrong turn and didn't get back until close to Stege. One odd thing about the cycle route in Copenhagen is that our two maps didn't completely agree with each other, nor with the signed route. In cases like that we trusted the signs. After a brief look at Stege, we continued to follow the route, had lunch at Præsto, and rode on to Rødvig. Very scenic, little traffic except just past Præsto, pretty little villages. We stayed in a great little hotel in Rødvig and spent the evening wandering along the shore, with views of the chalk cliffs, and some kayakers. Close to Rødvig, my rack broke. 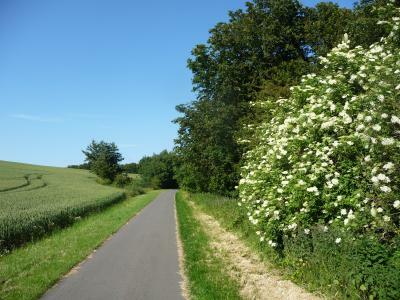 Why it broke on Denmark's perfect bicycle paths and not on Mecklenburg-Vorpommern's rough dirt tracks I don't know. I got it fixed temporarily with extra screws and straps, but I needed a new one quickly. So we deviated from the cycle route again at Tommestrup and went to a bicycle shop in Store Heddinge that our hotel hosts in Rødvig had found for us. We returned to the route quickly after that. 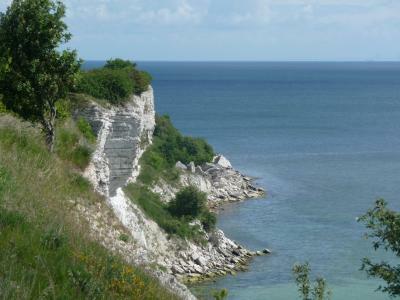 Another little detour brought us to a scenic viewpoint at Stevns Klint. 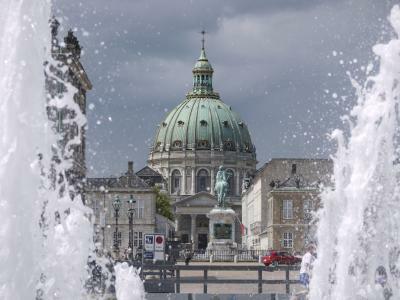 The remainder of the route to Copenhagen does its best to avoid Copenhagen's suburbs, but eventually, at Greve, we had to cross the town to reach the coast. The cycle route loops around Hundige Harbor and manages to keep us away from traffic and urban areas until we were quite close to downtown, and had to ride only some six kilometers through the city. 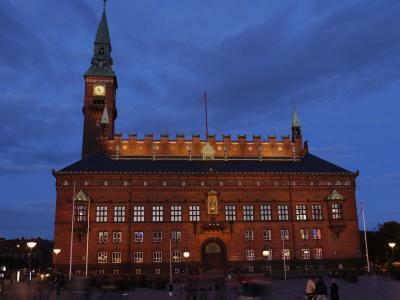 We stayed at the Ascot Hotel close to the Radhus (city hall). 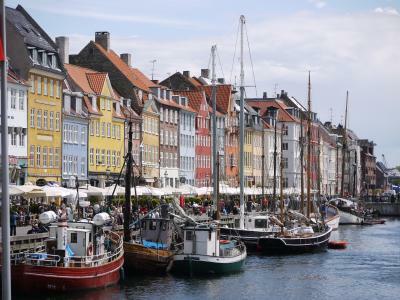 Copenhagen is Denmark's capital and largest city with a population of about 1.1 million. It completely escaped war damage, but suffered some damage by city planners who love wide busy roads. We spent the rest of the day, and the following day, wandering about downtown. The Oresund bridge, at a length of nearly 8 km, connects Copenhagen and Malmø in Sweden. 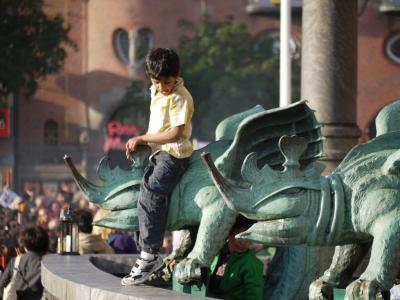 You can't walk or ride a bicycle across it, but Copenhagen's light rail system extends to Malmø and carries bicycles. 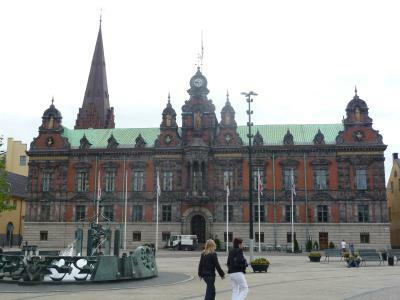 I took the 40-minute ride from Copenhagen's main station to Malmø central, and spent some time checking out the city. 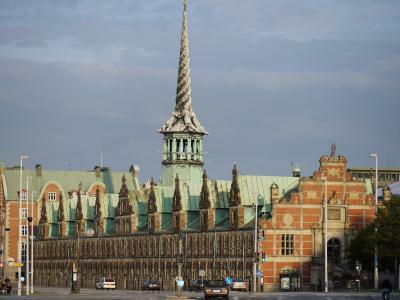 Malmø is nice enough but its sights cannot compete with those of Copenhagen, so I left fairly quickly. That involved a long time riding through suburbs, almost passing the light rail station preceding Malmø Central. Next time I'll definitely get off there instead of riding into the city. Obviously, the Berlin-Copenhagen cycle route ends in Copenhagen, so I was on my own here. 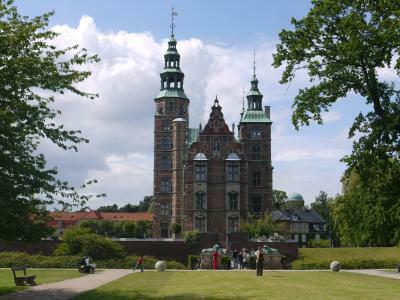 My GPS unit calculated a route to Trelleborg, and once outside Malmø it was a very scenic tour through the countryside. Garmin's idea of good routes in "bicycle" mode is often very dubious but here it worked well. 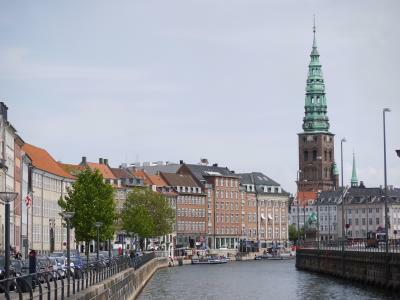 It's only about two hours between Malmø Central and the port city of Trelleborg, although a week later very strong headwinds would have made the ride much slower. 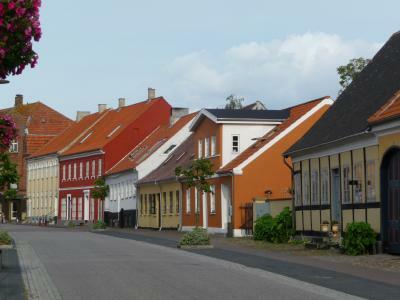 Trelleborg is a harbor town. 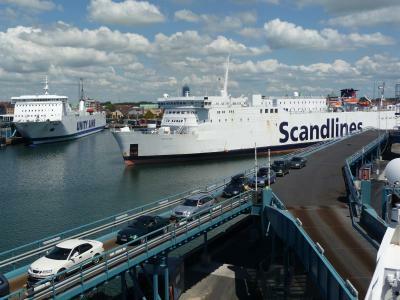 Ferries between there and Sassnitz and Rostock in Germany have been operating for a century. I was using the same line, Scandlines, and four hours later I was in Sassnitz. Sassnitz is the main town of the German island of Rügen. 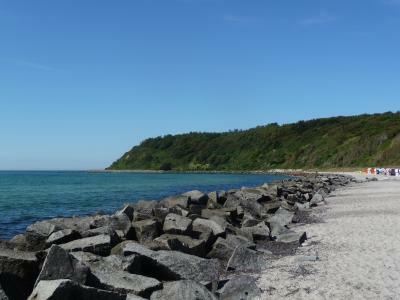 Rügen is a popular holiday destination with many beaches, scenic white chalk cliffs for which it is famous, many little villages and bicycle routes. All very pastoral. The harbor has recently been moved south of Sassnitz, and I went from there to the village of Sagard to spend the night. Sagard is nice, quiet, and quite unremarkable except that all its roads are paved with rough cobblestones. The next morning I used the northern cycle route to Schaprode, using the Wittow ferry to cross the water. 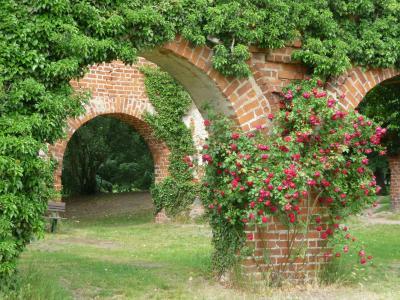 Rügen is composed of a number of convoluted islands and peninsulas. 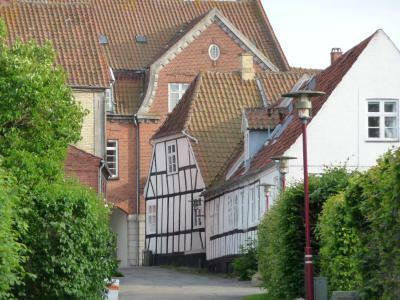 The most famous and popular is Hiddensee, a long narrow island with three villages: Neuendorf, Vitte (where my ferry went), and Kloster in the north. Much of the southern part is a nature reserve and closed off to visitors. 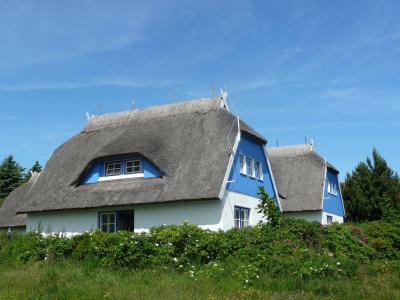 There are no cars on Hiddensee; it's small enough to walk, cycle, and for horse carts. After a lazy afternoon in Kloster, riding the steep and rough dirt trails to the lighthouse and other viewpoints, I took the ferry to Stralsund on the mainland, and took a train back to Berlin. I have deleted my flickr albums because I no longer trust US cloud services.